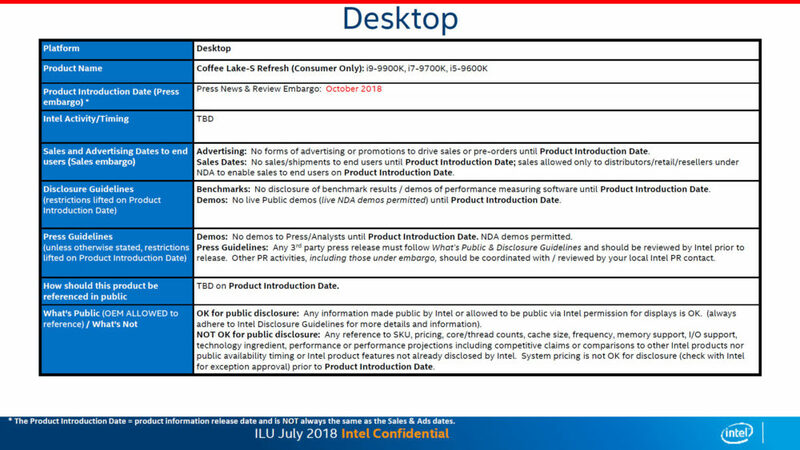 Some Intel documentation surfaced on the pending Core i9 9900K and i7 9700K, while most information was already publicly available, the slides also show the various turbo clock frequencies, and they certainly are interesting. The Core i7 9700K is an eight-core and eight-thread processor (that's right no Hyper threading) with a boost up to 4.9 GHz on one single-core. However, it can turbo at 4.6 GHz maximum on all cores. Intel's soon the be most high-end desktop processor the Core i9-9900K is the same 8-core part, yet now with HyperThreading enabled (16-threads). This processor has some interesting stuff, it can do 5.0 GHz on a single and dual-core turbo frequency. Also really interesting, it'll do a boost up to 4.7 GHz on all cores. That's pretty huge, to be honest. Let's hope the leaked slides are actually valid ones, the originate from PTT(Benchlife). That's not going to be 95W and it's likely going to quite a chunk above $300. Wonder if this is the end of the road for Intel, assuming Zen 2 will arrive as scheduled - only of course if it'll be able to encroach towards the mid 4ghz as well. We'll be lucky if it does 4.0 all cores, and that with some beefy cooling, and not in SSE jobs, which will throttle to 3.8 or something. Magic doesn't happen overnight; changing a number from 7 to 9 is insufficient. Needs more Faery dust for that. Ryzen giving Intel another panic attack? Still can't believe that an i7-k processor doesn't have hyperthreading. It is too good to be called a i5, but it is not good enough to be called a i9, so it cant really be named anything else then i7. I would guess it would be faster then a i7 8700k and i7 7820x, if it is able to run at the clocks described here, so it is really closer to the i9 labeling then i5. TDP has always been specified for running at base clocks only. Turbos are not guaranteed if your board and cooling cannot sustain them. So yeah, it'll use more then 95W if your cooling and power delivery can keep up with that. But all CPUs always have. Ryzen will also exceed the 95W rating. People here really need to remember that the TDP rating is based on base clocks. Intel isn't claiming 95W at 4.7Ghz, that's absurd. Also, since these are supposed to use real TIM for the IHS, 4.7GHz on all cores with a modest air cooler should be achievable. I avoid Intel wherever justifiable, but damn, some of you people are so caught up in hating them that you don't realize how ridiculous you sound. You have a point but Intel is also being misleading in regards to TDP's. The entire point of TDP's was so that vendors could determine proper cooling solutions. When you are selling products that boost clocks, you at min should publish the all core boost TDP since that is something that will occur when simply using the CPU as intended. You will certainly need a better cooling solution than dissipating 95W. I think these are going to be damn good CPU's by the way. No Intel hate here. There's room for both I dont hate either camp.Just remember intel has been top-dog for so long now and finally Amd stepping it up might of throw them off there game for a little bit but they will be just fine I think. Both companys need each other and bring out the best in one another I think. I started a new build based on Ryzen iam proud to say but I would never turn down team blue if I had the xtra $$$. Bye bye overheated ryzen cpu,s. with full of hardware related problems.